#ResumePeaceTalks was the cry of over a hundred women, men, young people, and seminarians who gathered at the forum, “Women of Faith Say: Seek Peace and Pursue It!” at the Saint Andrew’s Theological Seminary Chapel last July 29, 2016. “This event is in response to the challenge of supporting the call for the resumption of the peace negotiations between the Government of the Republic of the Philippines (GRP) and the National Democratic Front of the Philippines (NDFP),” said Ms. Arceli Bile, Women’s Desk Coordinator of NCCP. “It is important that a meaningful space for us not only to talk about peace, but also to continue our commitment to seek and pursue just and lasting peace,” Bile added. Clergy from NCCP, activists, and a former political prisoner shared their insights related to the ongoing peace process. Dr. Carol Araullo of Bagong Alyansang Makabayan (BAYAN) presented a brief history of Peace Talks and the importance of the peace negotiations between the GRP and the NDFP. Rev. Irma Balaba and Fr. Rex Reyes Jr. from NCCP both affirmed and challenged the need to continue the work for just and lasting peace and joined the call to commitment through the campaign “A Thousand Doves for Peace,” an advocacy for the resumption of the peace talks and the release of all political prisoners. Discussions and solidarity visits by ecumenical women continued in August 2016. Another forum entitled “Women for Peace, Women for Change” at St. Scholastica’s Museum, Vito Cruz, Manila was hosted was hosted by the Ecumenical Women’s Forum in partnership with Gabriela , Association of Women in Theology, and St. Scholastica Institute for Women’s Studies. One hundred women from different sectors were given inputs on the Women’s Agenda and updates on the GRP-NDFP peace negotiations and drafted concrete action points how women can push forward this agenda and the peace talks. As a concrete expression of commitments made in the ecumenical women’s peace process discussions, ten members of the NCCP Women’s Committee visited the women political Prisoners in Camp Bagong Diwa in Taguig for a short liturgy, a fellowship lunch, and distribution of toiletries. 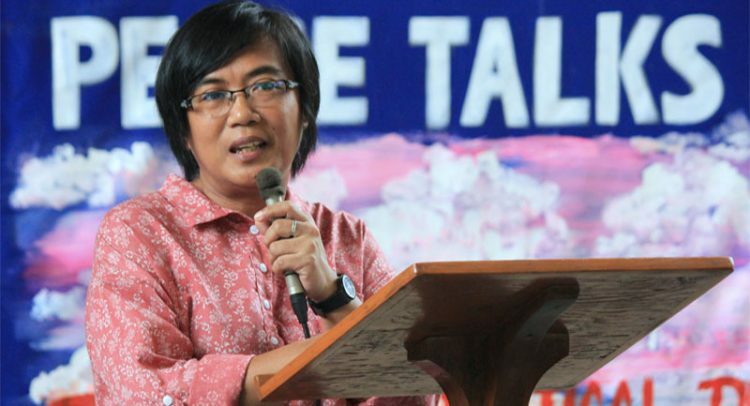 “While the women we’ve met in the visit were happy because some of the NDFP political consultants who were also political prisoners were released, their continuing hope and call remain that to be the release of all political prisoners in the country,” said Bile.